FREEMINER: Robin Morgan worked underground right to the end of his life. TRIBUTES have been paid to Freeminer Robin Morgan who died last week at the age of 80. Mr Morgan purchased Hopewell Colliery, some 23 years ago and only sold it last year although, he continued to work there until last Wednesday – the day before he died. While the mine continues to produce coal, it also operates as a museum, giving visitors guided tours underground. Mr Morgan starting working underground with his brother by taking time off school at the age of 13. He was eventually registered as Freeminer No.4215 on July 1, 1975. Rich Daniels, who was working with him at Hopewell the day before he died, said: “It came as a complete shock to us all here. “We turned up for work on Friday as usual and when Robin had not arrived by nine we knew something must be wrong. Then we heard that he had died just the day before. 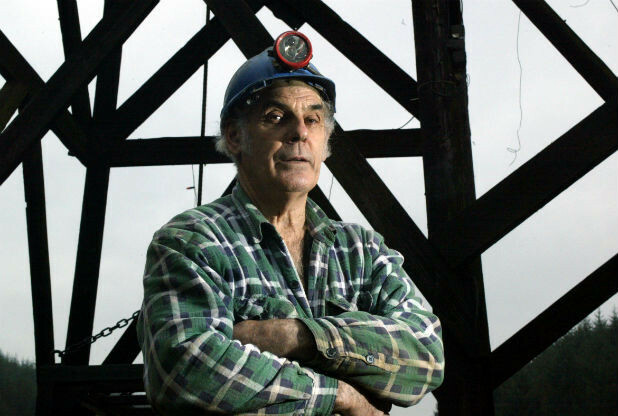 The Forest of Dean has lost one of its freemining legends following the death of ‘gentle giant’ Robin Morgan. Mr Morgan was thought to be the oldest freeminer still mining in the Dean. He started at the age of 15 and was down a mine even earlier helping his father at 14. Jane helped to run Hopewell Colliery with her father, which offers underground tours. She said: “It was a pleasure to work with him and get to know him. News of his passing brought an outpouring of grief on Facebook pages with universal tributes describing him as a ‘true Forester’ and a ‘wonderful man’. “I never was that interested in talking about the pits but now they are some of my favourite memories of dad,” said Jane. During his working life he worked the face of deep mines for the National Coal Board, dug tunnels in Gloucester, and under the railway at Cheltenham. He had some time away from the coal face doing other work, but mining always drew him back underground. “I can’t imagine not mining – wouldn’t know what to do with myself,” he once said. He was passionate about preserving the mining heritage of the Forest and opened part of his Hopewell Colliery as a museum. It wasn’t a money spinner – what was important to him was passing on the legacy and knowledge of the freeminer. In recent years he expressed concern about freeminers of the future. With the closure of the maternity hospital at the Dilke, he worried a whole generation of Forest children would be born outside the Forest, losing their freemining rights. Rich Daniels is one freeminer who will continue Mr Morgan’s legacy. Rich worked alongside him at Hopewell Colliery and describes him as ‘one of a kind’. He said: “He was a true Forester and he leaves a huge legacy in his commitment to freemining in the Forest of Dean. Rich added: “In his time he achieved what he wanted to achieve in order for the free-mining tradition to continue. “He had immense knowledge of the trade that is unique to the Forest. You won’t find any of it written down. “Freemining is an oral and practical tradition and that still holds today. You learn it by working and that’s what Robin did. Stephen Harding shines a light towards the steep, narrow, forbidding tunnel, dark as a raven’s eye. The steep, descending, aperture offers no hand of comfort for those who do not possess a miner’s steel. For Robin Morgan at 78, the oldest “free miner” still mining in the Forest of Dean, this dark place would not be given up lightly. Robin extracts coal from Hopewell Colliery, with the help of brothers Stephen and Richard Harding. “People think I have adopted them,” says Robin as the twins reach daylight. For 700 years the Free Miners of the Royal Forest of Dean, Gloucestershire, have mined coal but now their future is in doubt. It was the skill of their forefathers in tunnelling under castle fortifications that earned them the right, by Royal decree, to mine anywhere in the forest without hindrance. Robin Morgan, aged 62, works one of only two full-time mines remaining. Robin has been a miner since the age of 15 and was down a mine helping his father at 14. Robin is now helped by his son Neil, aged 40, who became a free miner after losing his factory job. Six days a week they travel underground, at the Phoenix Mine, which dates back to 1821, to cut out coal for the domestic market. They still use pick and shovel to tunnel to the coal face and the mine is little changed from its Victorian origins. The coal face is narrow and the miners must work lying on their stomachs. Clay above the coal becomes waterlogged from the forest above and covers the miners in a grey film. The sheer weight of the clay is supported on pit props cut from the forest timber. Coal is loaded into the carts by shovel and each cart, weighing half a ton, is winched from the coal face and then pushed out of the mine by hand. In the past pit ponies and even children were used to pull the carts to the surface. Like all free miners Robin and Neil were born in the Hundred of St Briavels and worked a year and a day underground to claim their birthright. However the future of the free mining tradition looks set to die out with the closure of the nearby hospital, meaning newborn boys are born outside the forest, and with the high cost of insurance for miners it is no longer possible for a mine to employ men. In its heyday in 1849 there were more men underground than above in the forest.Today there are around a few hundred free miners surviving, only a handful now cut coal and while there are large seams of coal under the forest few men would want to work such a hard way of life unchanged by time and technology.